What do you like best? Cookies or cakes? Tough choice … Would be fun to know what exactly you like, I know what kind of recipes I’ll should post here. Madeleine is a cake I’m doing a lot, just because it’s so easy and quick to do. Does not take many minutes you have cookies that get your guests to marvel over. 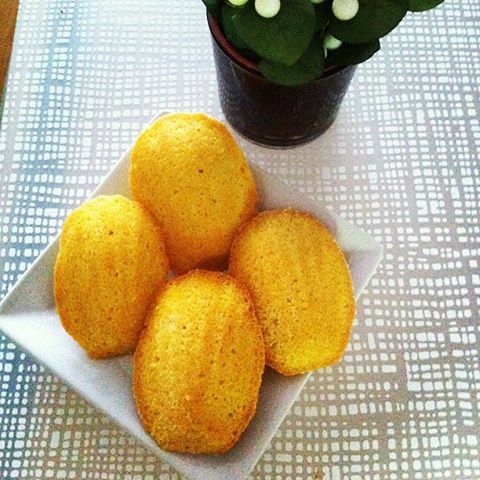 The classic Madeleine is with lemon but I changed a little bit. Mix all ingredients until smooth. Fill Madeleine molds which are greased and breaded evenly so all shapes get as much batter. Bake at 175 degrees about 10 minutes. Mm what a lovely idea, with orange blossom water! They look so light and fluffy! The first time I saw these was on Food Network. I’m SO glad I didn’t have to hunt down a recipe! They will be perfect for Christmas. Yes they are 🙂 And so easy to make.